1. Workshop on “Tour Making”, Mr. Aravind Paranjpye, Officer for Science Popularization, IUCAA, Pune, October 18-19, 2010. 2. Seminar on “Cyber Crimes”, Mr. E.S. Bijumon, DYSP, Cyber Cell, Trivandrum, December 17, 2010. 3. Workshop on “FOSS and BOSS”, Smt. Saleena H, Senior Technical Officer, CDAC, Trivandrum, December 17, 2010. 5. Seminar on “Best Programming Practices”, Dr. Ashish Mahabal, Senior Research Scienist, California Institute of Technology (Caltech) USA, (Erudite Scholar- Mahatma Gandhi University), January 20, 2011. 6. National Conference on “Computing and Communication (NCCC 2011)”, School of Computer Sciences, Mahatma Gandhi University, Kottayam, Kerala, May 26-27, 2011. “A Brief History of Computing” by Prof. (Dr.) S.K. Sinha, CEDT, Indian Institute of Science, Bangalore. “KERA- A New Language for Synthetic Biology” by Prof. (Dr.) AchuthSankar S. Nair, Director and Sri. Umesh, Assistant Professor, State Inter-University Center of Excellence in Bio-Informatics, University of Kerala. 7. Workshop on “Teaching-Learning Process”, by Prof. (Dr.) R. Vijayakumar, HOD, School of Computer Sciences, Mahatma Gandhi University, Kottayam, Kerala, 2011. 8. Workshop on “Computer Networking Leading to CCNA Certification”, March 16, 2011. 2011-12 1. National level seminar by Ms. Easwari PV, Senior consultant , Siemens Information Systems Limited, Bangalore, Dr. Achuth Sankar S Nair, Hon. Director, Centre for Bio-Informatics, Dr. K S M Panicker, Dean, FISAT in December 2011. 2. Conference on “Computing Paradigms and Bio-informatics” (CPBI 2012), School of Computer Sciences, Mahatma Gandhi University, Kottayam, Kerala, January, 2012.
i. “Computing in New Biology” by Prof. (Dr.) AchuthSankar S. Nair, Director, State Inter University Center of Excellence in Bio-Informatics, University of Kerala. ii.“High Performance Computing Paradigms” by Mahesh C., FISAT, Angamaly. iii.“Bio-Informatic Approach for Structure Function Analysis Polyketide Synthases: Lessons”, Dr.Radhakrishnan E K, School of Bio Science, Mahatma Gandhi University. iv. “Cloud Computing” by Prof. (Dr.) Paulose Jacob, HOD, Department of Computer Science, Cochin university of Science and Technology, Kerala. 3. 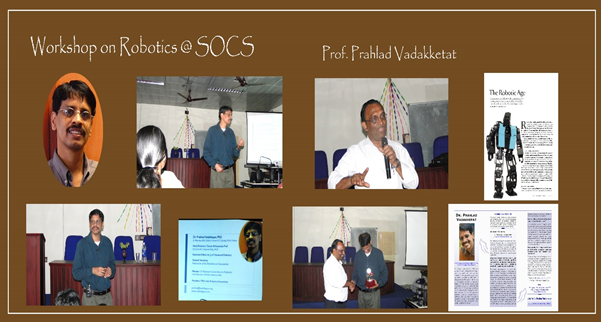 Seminar on “Computational Intelligence, Robotics and Autonomous Systems” by Dr. Prahlad Vadakkeppat, National University of Singapore, January 3rd, 2012. 2012-13 1. 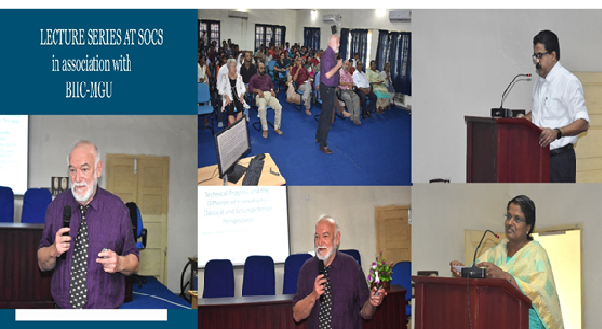 Workshop on “ Open source software “ was organized by the School during 2012 , inaugurated by Dr.Iqbal , former Vice-chancellor of Kerala University. 2. National level technical talk on “NP Complete Problems and High Performance Computing” as part of Interface2012 in Dec, 2012. 2013-14 1. The school was a nodal centre for the One day ISTE e-Workshop on “Creative Teaching”, October 5th 2013 through A-View, an e-learning software. The Seminar was conducted by the Department of Computer Science & Engineering and Computer Applications of AmalJyothi College of Engineering. Communication skills and career oriented tools for teachers- by Mr.AbrahamKurien IPS (former DGP,Govt. of UP,Member, Civil Service Interview Board of the UPSC ). 2. National Seminar on “Computing and Communication” at School of Computer Sciences, December 2013.
iv. Latest Trends in Software Engineering- by Sri. Krishnan Chittoor, S/W Developer, Microsoft India Ltd.
2014-15 1. A seminar by Dr Manjaiah, Professor, Dept. of Studies and Research in Computer Science, Mangalore University on “Systems Programming” on 21.07.2014. 2. Spoken Tutorial project(an initiative of NMEICT, MHRD, Govt. of India) in the University, a training session at School of Computer Science and Engineering/Computer Applications/IT institutions under M G University on 27.08.2014. Mr.Swapnil More, Training Coordinator, Spoken Tutorial (MHRD, NMEICT) IIT Bombay. 3. Seminar on “Research Topics for M Tech Dissertation” at School of Computer Sciences by Dr Madhu S Nair, Asst.Professor, Dept. 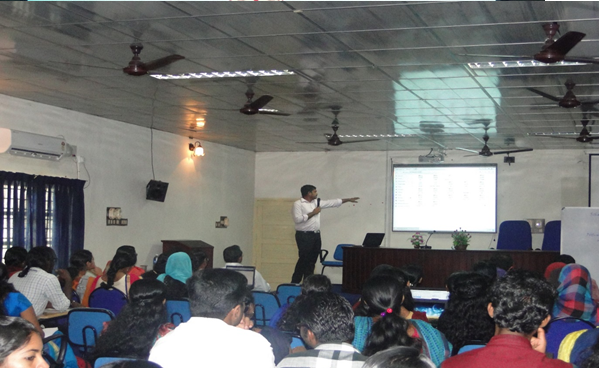 of Computer Science, University of Kerala on 18.09.2014. “How to write research proposals, funding agencies, filing patents” Dr.Soney C. George. 5. International Seminar on “Talking Like Humans” by Christy Alias, Ph.D Scholar, Trinity College, Dublin, Ireland on 6th December 2014. 6. A workshop on ‘Training A-view System’ by A-View team of Amrita University under the initiative of NMEICT, Ministry of Human Resource Development, Govt. of India, on 23rd February 2015. 7. A workshop on ‘Scilab’ by the Spoken Tutorial Project, through “Talk To A Teacher” project of IIT Bombay on 25/3/2015, funded by National Mission on Education through ICT, MHRD, Govt. of India. 2015-16 1. As part of strengthening the activities of the Placement Cell of the School, a one-day workshop on “Skill Enhancement” was organized for students of the School on 19.08.2015. The event was organized in remembrance of Dr. A.P.J. Abdul Kalam. Two of our alumni, who are well experienced have handled the sessions on “Principles and Practices for a Good Professional and Personal Life” and “How to Face an Interview”. 2. National level 3-day E-conference using the virtual class room and video-conferencing facility set up in the School. The School participated as a Nodal Centre in the National Conference on Research in Emerging Areas (NACORE 2016), a National e-conference organized by AmalJyothi College of Engineering and Technology from 28.01.2016to 30.01.2016. The event was sponsored by KSCSTE in association with ISTE Kerala Section. Research scholars and M Tech students of the School presented research papers in the conference, which had around 20 nodal centres participating from across the Nation. “Photo-acoustic tomography and applications” by Dr.R M Vasu, Professor, Indian Institute of Science, Bangalore, India. “Cloud Security and its Opportunities” by Mr.Sreekanth R Iyer, Cloud Security Architect (CTO’s Office), IBM Cloud, IBM Master Inventor, Member – IBM Academy of Technology, Open Group CertifiedDistinguished Architect. 3. 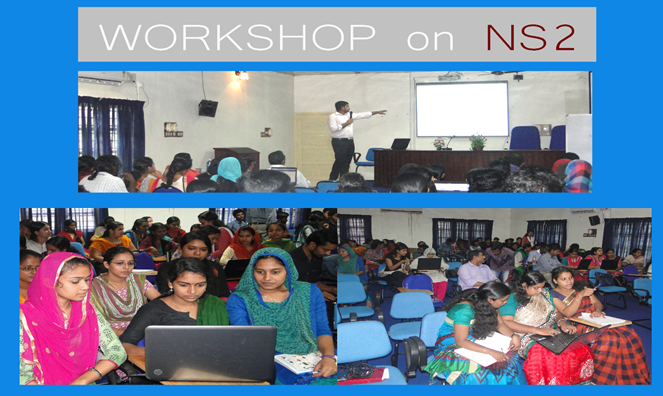 A 3 day workshop on “Network Simulator 2” (19.11.15 to 21.11.15) for faculty members as well as M Sc/M Tech and Research students of the School. 4. Seminar on “Image Processing Technologies for Defence Applications” by Dr.Lekshmi S, Scientist , NPOL ( also an alumnus of the School), on 4.12.2015. 5. Two-day National Workshop on “India’s First Cloud Computing Championship – IFC3 INDIA” in collaboration with Neuromancers, IIT Bhubaneswar and Infero, Scitech Counsil IIT Hyderabad from 9.02.16 to 10.02.16. Our School served as a zonal centre. Students from affiliated institutions also participated. Three delegates were selected for the National level competition. 2016-17 1. A two-day National Workshop on “India’s First Cloud Computing Championship – IFC3 INDIA” in collaboration with Neuromancers, IIT Bhubaneswar and Infero, Scitech Counsil IIT Hyderabad from 9.02.16 to 10.02.16. 2. A workshop on “Cloud Solutions and Implementation” for faculty and technical staff of the School on 28.06.2016 by Mr. Saneesh Kaniyath, Sr. Technical Consultant, Smartsoft, Cochin. 3. 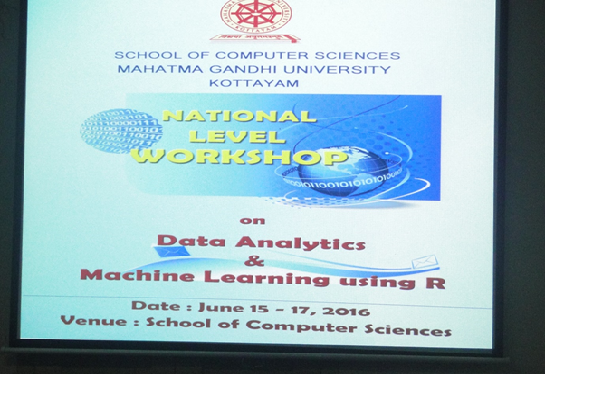 Three day National level workshop on “Data Analytics and Machine Learning Using R” June 15-17, 2016 as part of Capacity Building and Knowledge Upgradation for faculty members and M Sc/M Tech/M Phil and Research students of the School , in collaboration with Scientific Computing Solutions, Chennai. 4. Seminar on “Remoteness Function on Median Graphs”, 2nd Dec 2016, by Dr. Ajitha R. S., Post Doctoral Fellow, University of Kerala. 5. Faculty Development Programme – Two Weeks Capacity Building Workshop on “E-Learning and E-Content Development” 16th – 31st January 2017, in association with College Development Council,Mahatma Gandhi University and University Centre for International Co-operation (UCIC), at School of Computer Sciences. 6. Special Lecture on “Innovation and Technology” by Prof. Heinz D Kurz, Professor of Emeritus, Graz Schumpeter Centre(GSC), University of Graz, Germany, on 1st March 2017 in association with Business Innovation and Incubation Centre (BIIC) and University Centre for International Co-operation (UCIC) of the University. 7. International Women’s Day celebrations – 9th March, 2017, Special Talk “Women Empowerment and Legal Protection” : and Debate on “Are Women Secure in Modern Society?”. 8. Five day National level workshop on “Data Analytics, Mining and Machine Learning Using R” March 27-31, 2017 as part of Capacity Building and Knowledge Upgradation for faculty members and M Sc/M Tech/M Phil and Research students of the School , in collaboration with Scientific Computing Solutions, Chennai. 2017-18 1. One Day Worksho on “Enhancement of Soft Skills”, organised by SPARK, School Of Computer Sciences,on 21st July, 2017. 2. Special Lecture II, Innovation lead development in India and Africa: Prospects, Challenges and Grounds for Cooperation by Prof. Mammo Muchie, organised by BIIC, Mahatma Gandhi University, in association with School of Computer Sciences and KN Raj Centre for economics on 01/08/2017. 3. Special Talk and Interaction on Fellowship Offered by Govt. of Australia for Masters, Ph.D, Post-Doctoral and Executive Levels in Australian Universities, by Dr.K.S.Beena, Professor, CUSAT, Cochin, Endeavour Awards, Ambassador appointed by Australian High Commissioner to India in Association with UCIC, Mahatma Gandhi University on 24th May, 2017. 4. Three Day Softskill Development Workshop organised in association with Placement & Training Cell, Mahatma Gandhi University during 3-5 October, 2017.